If you decide not to do a pack trip, here are some great places to stay nearby so you can come out and do a guided day ride with us. 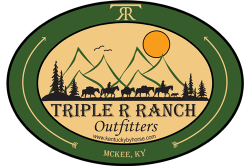 All places to stay are located in Jackson County and are less than thirty minutes from Triple R Ranch. ​A Simple Refuge Bed and Breakfast- Donna and Jerry will make your stay in Jackson County so relaxing! JAC Country Cabin Rentals- Located in the heart of the Appalachian mountains! Jarvis Mountain Cabins- Relax in peace and tranquility with all the modern conveniences. S-Tree Campground- Federal Forest Service Campground. Free primitive camping to the public and no reservations necessary. Shady Lane Cottage- Nestled in the breathtaking rural scenery of the Appalachian Foothills of Jackson County, Kentucky, Shady Lane Cottage offers a chance to remove yourself from the bustle of the city, and join us in the land where outdoor adventures happen. Sheltowee Trace Rental- Choose from a beautiful cabin or camper hook-ups right of Hwy 421. ​​Trails End Motel- Bob has great motel prices! ​Turkey Foot Campground- Federal Forest Service Campground. Free primitive camping to the public and no reservations necessary. HorseTrailDirectory.com - Horse Trails and Campgrounds - Horse trails and campgrounds throughout North America (and some outside NA). Use riders' ratings of trails and camps and get local weather forecasts to help plan your trip. Centaurfencing.net - Perfect for all of your horse and livestock fencing needs. fencechargers.net - Perfect for all of your horse and livestock fencing needs.